Eye-Fi cards are a neat technology that's been around for several years now. 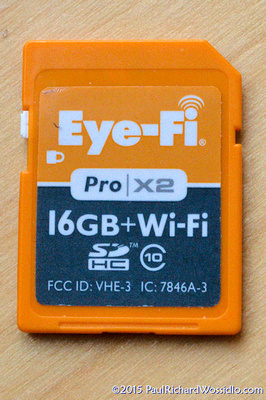 An Eye-Fi card is an SD (Secure Digital) memory card (typically found in most non-professional digital cameras) that has both memory for storing the image files as well as a wi-fi chip that allows the files to be automatically sent to either one of the internet photo-sharing sites or transmitted to your laptop or tablet/smartphone. My recent upgrade to the Nikon D800E camera opened the possibility of my using an Eye-Fi card. The D800E is my first camera that includes two memory card slots. One is a standard Compact Flash card (the standard memory card for most professional photographers) and one SD slot. With this kind of configuration, many photographers will use a CF card for their primary photo storage, and use an Eye-Fi card in the SD slot to transmit the files. 1) Currently I set up my laptop at a wedding reception. Periodically I will copy photos of the wedding from my memory cards onto the laptop (which means the files are backed up). I'll then run a slide show so guests can see the photos from earlier in the day. Besides providing a service to the client, it is also effective advertising for me. With an Eye-Fi card, I can set it up so the files are automatically transmitted from the camera to the laptop, and automatically added to the slideshow. Guests will be able to see the photos almost as quickly as I shoot them, and I don't need to spend time at the laptop loading the photos. 2) I sometimes get asked to photograph events where they want printing done during the event. The Eye-Fi card can send files to my laptop, where the clients can preview them prior to sending them to the printer. 3) When I'm on location, shooting a portrait session or a modeling session, I can have the Eye-Fi card send the files to my iPad, so the client can get a preview of the photos prior to my posting them online. With the D800E, the first thing I had to consider was the size of the files. When shooting at the full 36MP resolution of the camera, each image file is approximately 50 MB. A wifi connection isn't fast enough to send that file quickly. What other D800 users do is shoot "RAW + JPG" (which creates two files), with the JPEG file size set to "Small" (about 9MP). The RAW files are saved to the CF card for future use, while the JPG is saved to the Eye-Fi card for transmission. The small JPG files transfer quickly. It is interesting to note that what is considered "Small" on the D800E has a resolution of 3600x2400 pixels, which is larger than what I got from my original D70 dSLR (3000x2000 pixels), and is more than enough for printing up to 8x10 prints. In Part 2, I'll discuss setting up the Eye-Fi card and how well it meets my needs.